The memorial to Bruce and Gillis is a squat granite shaft on a stone and masonry base. It stands approximately six feet tall and holds three bronze tablets. The largest of the three, on the front, highlights Charles Bruce’s political career during the Revolution and early days of the Republic. A smaller plaque to Gillis is on the left side and the third plaque which recognizes the land donation for Bruce Park is on the right side. The memorial is dated 1922 but continual rains forced the dedication to be delayed several times until September 1923. Bruce and Gillis are buried in a small cemetery across the street. A restoration of the site in 2009 saw new cobblestone pavers laid around the monument, benches installed, shrubs planted and flag poles installed— for the US flag, North Carolina flag and a replica of the flag carried during the Battle of Guilford Courthouse in March 1781. This flag is referred to as the Guilford Courthouse flag. 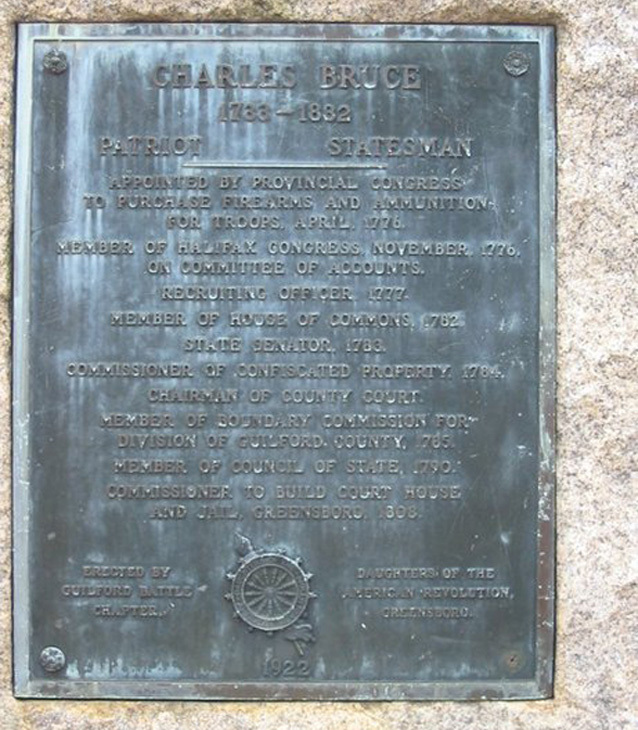 Bruce plaque: CHARLES BRUCE / 1788-1832 / PATRIOT________STATESMAN / APPOINTED BY PROVINCIAL CONGRESS / TO PURCHASE FIREARMS AND AMMUNITION / FOR TROOPS, APRIL 1776, / MEMBER OF HALIFAX CONGRESS, NOVEMBER, 1776, / ON COMMITTEE OF ACCOUNTS, / RECRUITING OFFICER, 1777, / MEMBER OF HOUSE OF COMMONS, 1782, / STATE SENATOR 1783, / COMMISSIONER OF CONFISCATED PROPERTY, 1784, / CHAIRMAN OF COUNTY COURT, / MEMBER OF BOUNDRY COMMISSION FOR / DIVISION OF GUILFORD COUNTY, 1785, / MEMBER OF COUNCIL OF STATE, 1790, / COMMISSIONER TO BUILD COURT HOUSE / AND JAIL, GREENSBORO, 1808. Lower right: DAUGHTERS OF THE / AMERICAN REVOLUTION, / GREENSBORO. Bottom center below Daughters of American Revolution logo: 1922 Gillis plaque: GILLIS, / LIGHT-HORSE HARRY LEE’S HEROIC / BUGLER BOY WAS KILLED NEAR HERE / BY TARLETON’S DRAGOONS, / FEBRUARY 12, 1781. During movements of the Patriot Army in the month prior to the Battle of Guilford Courthouse, Col. “Light Horse Harry” Lee stopped to dine at the home of Charles Bruce. During this stay, a farmer, Isaac Wright, appeared to warn the soldiers and Bruce that a group of British dragoons was on the road not far from the Bruce home. Lee sent a group of men to follow Wright and to see if the story was valid. Wright’s horse was unable to return to the location since it had been ridden at top speed to warn the Patriots. Lee offered his bugler boy’s horse and so began the story that has been passed down over 200 years. The bugler, James Gillis, was afraid that he would not see his horse again and decided to follow along on the farmer’s horse. The troops and Wright accidentally surprised the dragoons and galloped back to report to Lee and secure reinforcements. The dragoons gave chase and Gillis’s tired horse was overtaken. Col. Lee ordered a group of men to return and help the bugler boy. They arrived as the unarmed Gillis was being slashed to death while begging for quarter but Lee’s troops killed seven of the Dragoons in turn. The death of Lee’s bugler boy became one of the best known stories of the American Revolution in Guildford County. Another memorial to Gillis has been placed at the Guildford Courthouse National Military Park and another at the actual site of his death. Nearly an acre of land that had once been owned by Charles Bruce was donated to the Guildford Battle Chapter, D.A.R. in the early 1920’s. They developed the site as Bruce Park. Along with placing the Bruce and Gillis marker, the remains of the two men were moved from unmarked gravesites and re-interred across the street from the memorial. Over time the site fell into disrepair. Joseph Campbell for his Eagle Scout project helped restore the site which was then re-dedicated in 2009. 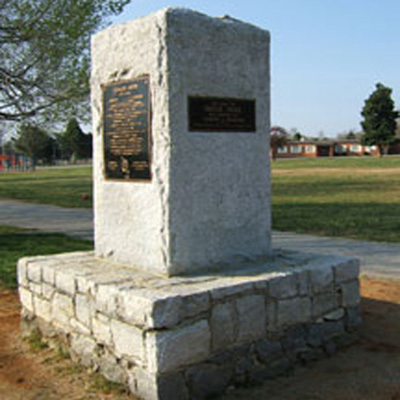 The marker is located on Summerfield Road between Centerfield Road and Trainer Drive in Summerfield, NC. Summerfield Elementary School is in the background across an athletic field. The memorial marker is sided by mature shady trees.